Group Material, Democracy: Education. 1988. Dia Art Foundation, NYC. 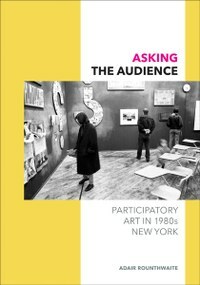 Adair Rounthwaite, Asking the Audience: Participatory Art in 1980s New York. Minneapolis: University of Minnesota Press, 2017. If You Lived Here…and Democracy provide Rounthwaite with exemplary lenses onto broader issues. Both projects mark early instances of collaboration between artists rooted in alternative practices and elite institutions, a trend that would become more pronounced in participatory art throughout the following decade. By focusing on the role of the audience in each case, she explores the varied meaning of participation as the binding force in this new, surprising union. In a further similarity, both exhibitions comprised multiple installations exploring a range of urgent subjects. Rosler’s three-part If You Lived Here… focused primarily on housing, homelessness, and urban planning, while Group Material’s four-part Democracy focused on political participation, cultural politics, the AIDS crisis, and deteriorating public education. Finally, both exhibitions included town hall meetings, collectively construed as a primary mechanism for encouraging and gauging audience participation. Rounthwaite pays special attention to these assemblies, arguing that in their affectively charged speeches and silences, the audience complicated artistic and institutional expectations of participation. Rounthwaite’s work consists of four well-illustrated chapters, each devoted to a specific constellation of questions and issues raised by her central case studies. She begins by locating Dia within the complex terrain of 1980s New York. Founded by oil heiress Philippa de Menil and Heiner Friedrich in 1974, Dia’s early years focused on fostering the genius of individual artists, providing monetary resources and working space to nurture the birth of new works of art, often in far flung locations accessed by only the most ardent and elite art lovers. For example, Rounthwaite highlights the inaccessibility of Walter De Maria’s The Lightning Field (1977), located in the remote New Mexican high desert. 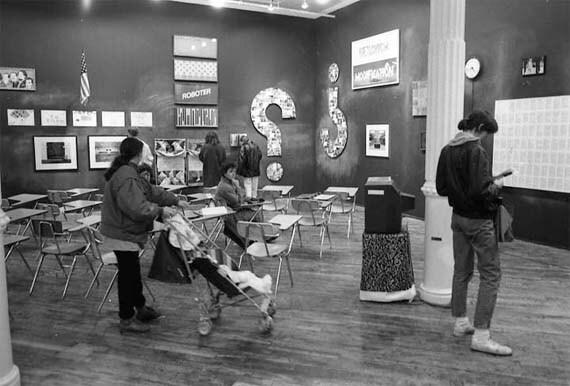 New York-based artworks, like De Maria’s New York Earth Room (1977), were cloistered away in structures with ever-changing hours and little interest in public outreach. The many layers of privilege sheltering Dia and the works it supported began to peel away in 1983, when plummeting global oil prices rattled stocks and sparked a financial crisis. The ensuing reorganization of Dia in the mid-1980s, marked by a newfound emphasis on the public, laid the foundation for Democracy and If You Lived Here… while reflecting a larger shift central to Rounthwaite’s work: the hybridization between alternative art practices and high art institutions within the tumultuous context established simultaneously by the privatization of funding, rising cultural conservatism, and artistic discourses of multiculturalism. This intermixing presented political and ethical quandaries both to institutions and to socially engaged artists committed to the critique of institutional conservatism and violence. What publics would these exhibitions address and attract? Could artists create radical work collectively in spaces long associated with privileged individualism? To take one compelling example: in the first chapter, “The Politics of Participation,” Rounthwaite describes tearing off her headphones, overcome by the scream of the artist Cenén, as recorded during an If You Lived Here… town hall meeting on homelessness (67). That cry, Rounthwaite explains, immediately changed the affective atmosphere of the meeting, investing it with a newfound intensity. Later, in her fourth chapter, “Art, Affect, and Crisis,” which explores the final phase of Democracy (“AIDS and Democracy: A Case Study”), Rounthwaite describes an interjection of another sort by ACT UP and Gran Fury member Avram Finkelstein, in the form of an impassioned speech critiquing the “codified” nature of the exhibition, its funding, and its detachment from crisis. At once confrontational and prolonged, Finkelstein’s intervention disrupts the coolness of the gallery setting, effectively creating a new, affectively charged space that both encompasses and pushes against the institutional boundaries (183). In so doing, Routhwaite suggests, “it restores the emotional habitus of ACT UP, where mourning is converted into militancy” (184). The significance of audience-led affective alterations recurs in Rounthwaite’s third chapter, “Photography, Agency, and Representation,” in her analysis of two photographs of members of Homeward Bound, a homeless persons’ activist group engaged in Rosler’s If You Lived Here…. From one portrait to the other, bodies shift: heads turn towards or away from one another, smiles widen or fade, hands are raised or folded; posing gives way to a less obviously staged sociability (128). The differences between the two photographs raise questions about the interval that separates them, calling attention to the gap as an important zone of audience negotiation. What affective shifts accompany bodily shifts? The production of such affectively charged spaces re-centers and reinterprets crisis within these participatory art projects. To return to Finkelstein’s extemporaneous contribution, we might see his act of dwelling within his angry speech in light of the pleasures of slow death theorized by Lauren Berlant in her analysis of the “obesity epidemic.” Rather than creating a world outside the ascending neoliberal present, however, he creates a space saturated with its violence and demands that the artists, audience, and institution wade through it with him.3 Within these zones, crisis is both lived and foreclosed as the audience collaboratively contests temporalities of participation. Persisting in the archive, such moments continue to exert effects in the present: they force Rounthwaite to yank off her headphones; encourage the reader to linger a moment longer with a specific set of images; produce long blocks of text that hold the reader to a particular page. Does dwelling in these interstices entail a responsibility for their care or closure? Does that responsibility demand a rethinking, or dismantling, of the constricting form of the archive? In her conclusion, Rounthwaite grapples with both the materiality and the social meaning of participatory art’s archives, as well as Dia’s ongoing concern with present and future audiences. And yet, past audiences have not completely loosened their grip. The crises that Group Material and Rosler sought to illuminate and navigate have not been resolved. Instead, their management has been marked by processes of concealment and distraction; the violence of the state, undiminished, has become kaleidoscopic. Asking the Audience is a powerful record of the ways in which audiences, artists, and institutions sought to engage with those crises through the framework of participatory art. By tracking instances in which affective shifts led in unexpected directions and, in the process, reconfigured the exhibitions from within, Rounthwaite’s work points to the complexities inherent in “asking the audience”—and indeed, hearing what that audience asks of us. See, for example, Claire Bishop, Artificial Hells: Participatory Art and the Politics of Spectatorship (London and New York: Verso, 2012); Miwon Kwon, One Place after Another: Site-Specific Art and Locational Identity (Cambridge: MIT Press, 2002); Grant Kester, Conversation Pieces: Community and Communication in Modern Art (Berkeley: University of California Press, 2004); Shannon Jackson, Social Works: Performing Art, Supporting Publics (New York and London: Routledge, 2011). Ann Cvetkovich, An Archive of Feelings: Trauma, Sexuality, and Lesbian Public Cultures (Durham: Duke University Press, 2011). Lauren Berlant, “Slow Death: Obesity, Sovereignty, Lateral Agency,” Cruel Optimism (Durham: Duke University Press, 2011). Kristin Hankins is a Ph.D. candidate in American Studies at Yale University. 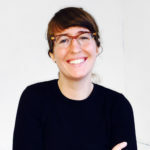 She studies public space, urban history, and visual culture.